Looks like HTC is developing its own answer to Android Auto. According to a Reddit poster, the Taiwanese company is working on a device, codename Cello, that is far more capable than Google’s in-car system. 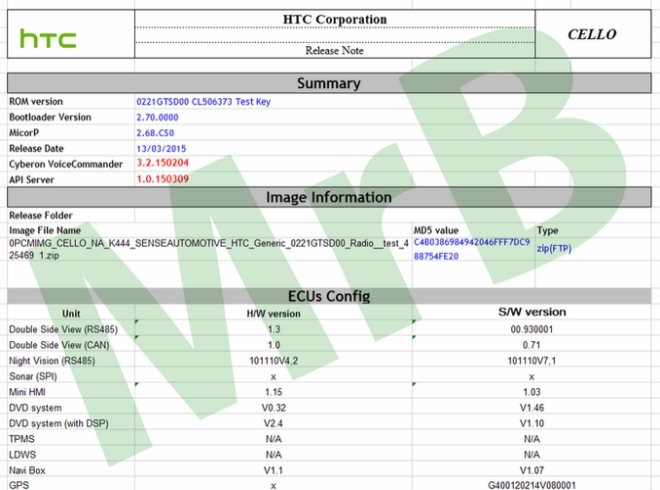 The user also posted what appears to be an HTC Release Note (see below). The device is said to be powered by Android 4.4 and runs a special version of HTC’s Sense UI, dubbed Sense Automotive, which is specifically made for cars. The features it offers include: Night Vision, Sonar, Mini HMI (Human Machine Interface), DVD, Tyre Pressure Monitoring System, Lane Departure Warning System, Navigation, and GPS. The user also revealed that the device was previously named as Autobot, and it has been in testing since Q4 last year.